My family and I had spent several days hiking through the Dolomites and it was near the end of our trip. We’d undoubtedly hiked many miles, but it seemed that we’d barely begun to explore the region. It was rich with history and natural beauty and I felt that I could have stayed and wandered its winding paths for months without ever seeing everything the mountains had to reveal. August 2018, single shot, additional exposures for highlights, focal length 14 mm, aperture f/11, shutter speed 1/24, ISO 64, tripod. We weren’t the only ones who were fascinated by the region. For most of the trip, we shared hiking trails with travelers from around the world who explored just as eagerly as we did. You get used to the crowds as a travel photographer — after all, they’re drawn by the same beauty that attracted me. But towards the end of our trip, I found myself alone on a hike to the Torre di Toblin. It was early in the day, so perhaps most people were not awake yet, but I had the area to myself. It’s a stark, desolate expanse, devoid even of plant life. I had the sense that I was the only living being in that part of the Dolomites, witnessing the earth before the creation of life. And it wasn’t a distressing thought; it was oddly peaceful to look out over the world as it might have appeared before it was populated with all of the earth’s creatures. 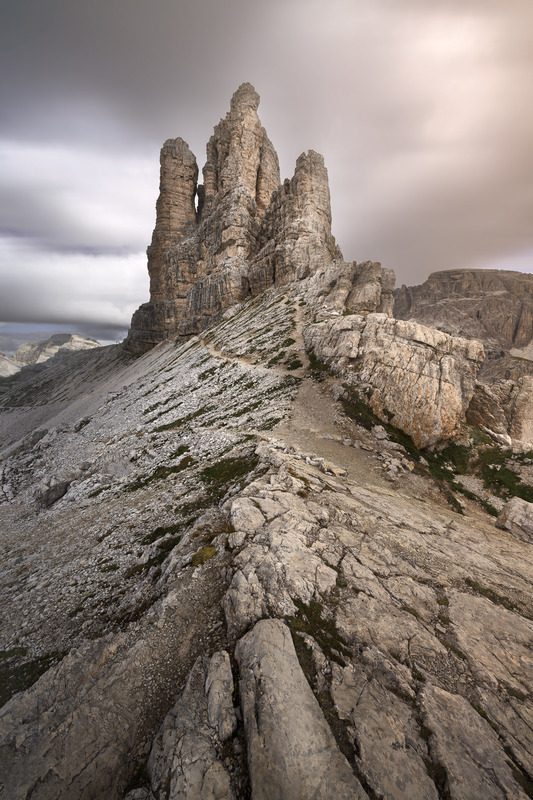 The sun rose higher and far below the peaks of the Torre di Toblin, life began to stir.